The last couple of weeks have been a struggle for me because I’m getting impatient to get in the house. The weather has been getting colder (and then warmer and then colder) and the little cabin is not really a warm place even with (sometimes) three space heaters blasting away. The cabin pipes that have always had the water drained from them by now and I’ve been feeling the pressure to close up this cabin. It’s been six months since we moved up here (both from the big house and from Florida) and we’re feeling the need to stretch out! 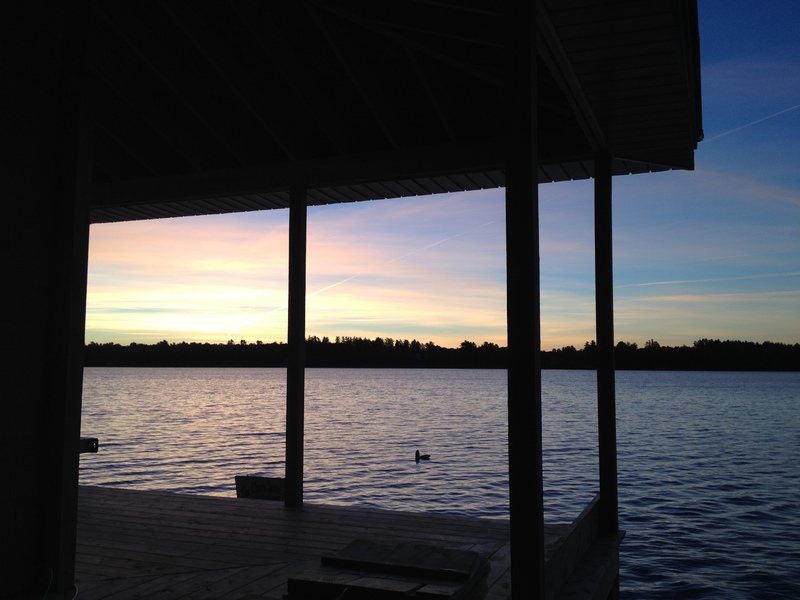 We are finally in the final stretch of building our home and it can’t happen fast enough as far as I am concerned. We are still waiting for our replacement cabinets to be delivered. I think we had both expected to hear from Home Depot in advance of their delivery about how they intend to make good on the near-disastrous kitchen order but there have been no calls. We expect the cabinets to be delivered early next week. We are crossing fingers and toes! Our intrepid ditch digger, Ron, came back to dig ditches for our water and gas lines. The water line has to be at least four feet deep so that it doesn’t freeze. With our rocky ground at the side of the lake, we were very lucky that we have Ron who found a few more big rocks but got us all dug out and ready. Of course, that meant that our driveway and most of the yard were a muddy mess when it decided to rain … and it rained sideways here … but Ned pulled out some of the boards that we’ve been keeping around “just in case” and made “bridges” so we could get in and out of the cabin and across the ditch to the new house. After many false hopes, we finally found a well company that was willing to help us. 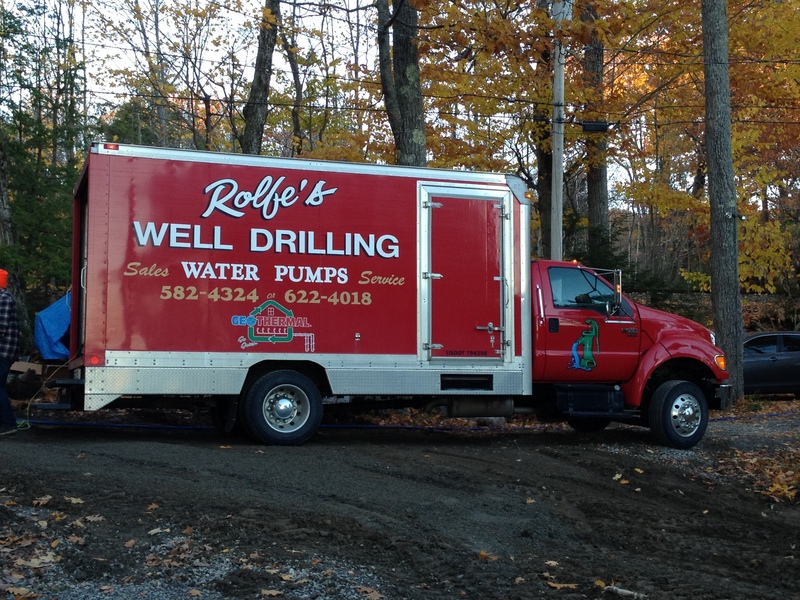 We are so grateful for the successful “fracturing” job by Rolf’s Well Drilling and we are happy to report that we have lots more well water! And now we have a new pump in the well and the new water line is in place. We’re all ready (almost) to hook it up in the house! We’ve had some difficulty with Dead River Company coming when they say they are coming but we finally have the gas line in the ground and they are scheduled to return on Wednesday with our new 1,000 gallon tank and they’ll be able to hook us up if the heating equipment is ready. I’d hate to think about the phone call that I’ll make if they don’t show up as they say they will. I’m working double overtime to not stress over their rather poor record so far. I’m trying to trust the process and breathe. 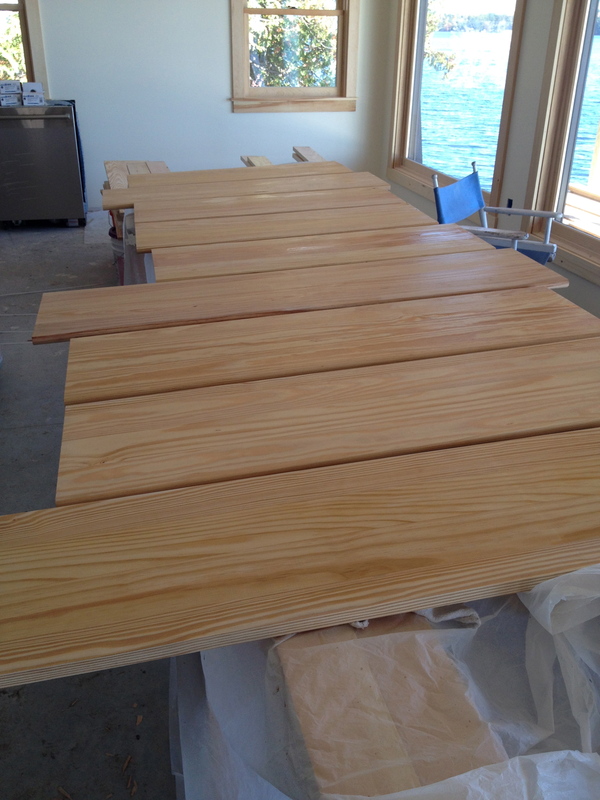 We have been polyurethane-ing all the pine for the trim and stairs. That’s a lot of wood that needs two or three coats with a sanding in between! Both Ned and I have been “painting” and we are not done yet. The wood floors are finished on the second floor (with the exception of the bathroom) and the third floor is almost there. Once the third floor floors are done, the ceiling will be done and then we’ll have more polyurethaning to do! The concrete floor needs to be stained before our stuff can come out of storage. That will not be a difficult job but we need to clean the concrete thoroughly, “etch” it with something so the stain will adhere and then stain and seal it. We’ve picked our stain and are ready to go … when all the other pieces are in place. Today Tom came out to put the deck at the entryway on the house. We officially have a front step. Yay! Our outside lights and two of the three kitchen pendants are in the house waiting for the electrician to get them hung. It’s bizarre to walk into the house and have lights on! We’ve ordered the balance of the outdoor fixtures and the ceiling fans and they should arrive pretty soon. Once they’re all in, the electrician is pretty much done. We do need him to provide a hook-up for our new generator, too. I am hoping we never need to use it but when you’re at the end of a dirt road, in Maine, in the winter … well, suffice it to say, it’s required. Ours isn’t fancy but it should keep the refrigerator and boiler going and a few lights on! 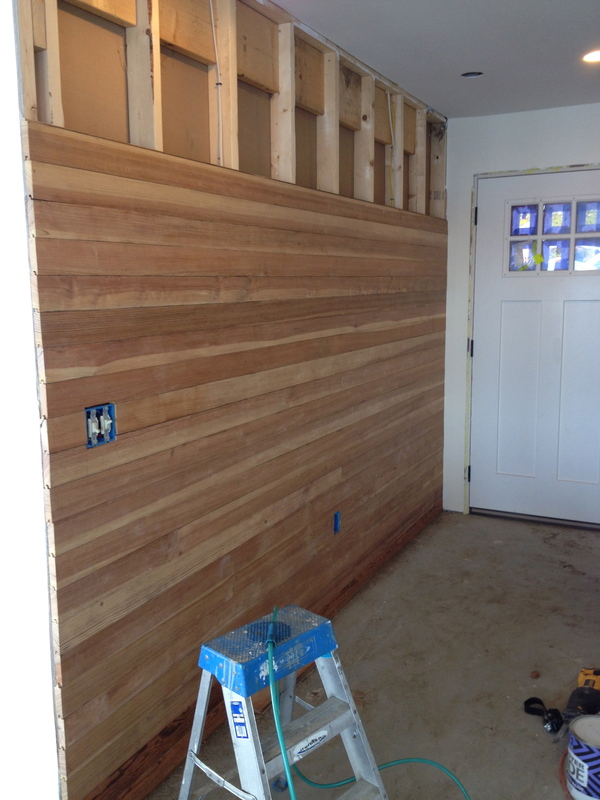 Ned has finished the wall in the front entryway. These are the salvaged floor boards from the old house. They’ve all been sanded and will be sanded once more now that they’re hanging. We both loved the idea and we both love the result! A nod to those who have walked the floors in the past. We have a move-in date of November 19th. A Thursday. And Ned’s younger daughter is coming for Thanksgiving. Not a minute to waste! This entry was posted in Building a Home and tagged concrete, Dead River Company, Fracturing a well, gas, Guest House, Lake Living, Messalonskee, Messalonskee Chronicles, polyeurethane, Propane, Rolf's Well Drilling, water, we get to live here, We live in Maine, yellow pine, yellow pine floors on October 31, 2015 by lindarockwell3. Wow…that is a heckuva lot to be doing in the next three weeks! Sorry for the delays and pains associated with them. You know I always hope for the best for you fabulous people.